There is plenty information about the cult of Mithras on the internet, but I was writing this short article in Dutch anyway, so why not translate it to English and put it here as well? My aim was a very general and short article, so I do not go into things too deeply. There is no longer scientific agreement on the origin of religion of Mithras. Actually I find the term “religion” not too suitable. The cult of Mithras was more like the mysteries of Eleusis, Isis, Bachus or Cybele than a religion such as Christianity. On the other hand, Mithraism may be more of a religion than the mysteries that I named. Mithraism was an initiation cult that had its peak in the Roman empire under soldiers and tradesmen. It didn’t originate in the Roman empire though. About 100 years ago, the Belgian scholar Franz Cumont (1868-1947) was the first serious investigator of the subject. He was of the opinion that Mithras is a Romanisation of the Persian god of light Mithra and Mithraism would be a separated sect of the Zoroastrian faith. For this idea he had a few arguments, some credible, other less credible. Still the ideas of Cumont are leading even to our own day and time. Nowadays Mithras is still called a “Persian god”. Also the second investigator of the mysteries of Mithras, the Dutchman Maarten Jozef Vermaseren (1918-), follows the ideas of Cumont, but with reserves. To Vermaseren we owe the massive work Corpus Inscriptionum et Monumentorum Religiones Mithriacae (part 1 1954, part 2 1960). In this work Vermaseren gives a dry survey of all Mithraic findings that were known to him. These are mostly remains of small statues, bass reliefs, etc, but of course Mithras-temples (“Mithraeums”) can be found among the rest. In another article I have filtered out a list of Mithraeums with links to those about which is information on the internet. The amount of findings and temples that Vermaseren names, goes into thousands. You might think that we are well familiar with what Mithraism exactly was. This is not true. No books have survived (if there ever where any) and we have no official history. (A “Mithras liturgy” can be found within the “Greek Magical Papyri”, but I doubt this is authentic Mithraic. (PGM IV 475-829).) 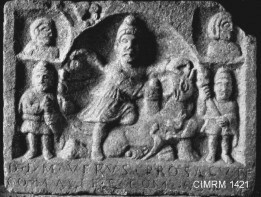 Only short inscriptions on altars and artifacts remain and only from such inscriptions scholars can try to reconstruct the convictions of the followers of the cult of Mithras. They succeeded partly, but naturally there is quite some discussion on some points. Forementioned facts have resulted in new theories in recent years about the symbology and origin of Mithraism. One of the most interesting works of this kind is by David Ulansey (see belows). In this book Ulansey argues that not Persia is the cradle of Mithraism, but Cilicia, an area in Asia Minor in what is now south-west Turkey and a bit further alongside the cost of the Mediteranean Sea. In this area the Perseus cult flourished under kind Perseus who was followed up by the pirate-king Mithridates who controlled much land around the Mediteranean Sea. Ulansey not only has good arguments for this idea, but they fit perfectly in his very astronomical interpretation of the Mithraic symbology. I can highly suggest his book. Of the remains that we know, by far the most are depictions of Mithras as a young man with his typical “Phrygian cap”, kneeled on a bull, stabbing his knive in the side of the bull. A Mithraeum is preferably a natural cave near a spring, or otherwise a small underground chamber, with a middle path leading towards the image of the bull-killing Mithras with on both sides of the path benches for the devotees. On some Mithraeums other images have been found on the side-walls, some have pillars or a fire-altar and a few larger ones have more rooms for ritual bathing and preperations. One Mithraeum in Ostia (Italy, near Rome) has mosaic works with the symbols of the seven grades of initiation on the floor. Mithras born from rockThe image of the bull-killing Mithras always comes with mostly the same figures. Always there are a dog and a snake “fighting for the blood coming from the bull” (Cumont and Vemaseren), sometimes a cup catches the blood. The blood or the tail of the bull are depicted as ears of grain. Always there are two torchbearers, sometimes a raven (messenger) and sometimes images of Sol and Luna, sun and moon. Cumont and Vermaseren thought that the scene under the bull has something to do with the battle between the elements, Ulansey has a much more interesting –and with his arguments much more plausible- hypothesis that the figures represent constellations (with Mithras being Perseus). Mithras is born from a rock and this rock is usually entangled by a snake. In his hands Mithras carries a dagger and either a globe or an arrow-container. Later in his life Mithras goes hunting, makes an eternal spring from a rock,lion-headed god chases the bull and eventually kills him, bringing fertility to the land. Something the scholars do not agree upon is the strange, monstrous god (?) that is usually displayed with a lions head. Therefor he is often called “leonthocephalic god”, but Cumont liked to use “Zervan” after the Persian god of time and Vermaseren “Aion” after the Greek god of time. The figure is not always depicted with a lions-head. Sometimes he is a young man with a lions head, but also a Gorgons head on his chest (and knees). Almost always the figure stands on a globe, is entangled by a snake and in his hands he holds objects that are not always the same. 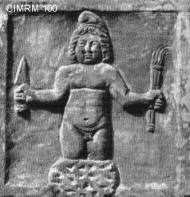 This god as a monstrous Gorgon makes the link between Mithras and Perseus even more likely (Perseus looks away when he kills Medusa, to prevent him turning to stone!). For several reasons that I will not discuss here, I am inclined to see the leonthocephalic as yet another aspect of Mithras (like with the torchbearers, see later). Interestingly enough, also the leonthocephalic god seems to be refered to in the PGM (I 144-148). Mithraism was a flexible conviction. Often you see not only Mithras in Mithraeums, but also texts or images that refer to Cybele, Silvanus or Greek gods. In Germany and Great Brittain are more than coincidental concurs of findings of Geman or Celtic findings and Mithraic. However here not in the same room, traditional, Roman and Mithraic cults often existed next to eachother in the same cities. Mithras is usually identified with the sun, but also often he is depicted together with Helios. The same can be said about other gods. The torchbearers are often said to be representations of the equinoxes and then Mithras is in the solstitiae. Personally I like the idea that the torchbearer Cautes (with his torch upwards) represents the upcoming sun, while Cautopates (with torch downwards) the setting sun. Mithras –of course- is then the sun at noon. The torchbearers look a lot like Mithras (including Phrygian cap), so the images is the course of the sun during the day. And the year! When the torchbearers are the equinoxes, Mithras represents the solstitiae. His ‘birthday’ is celebrated at the winter-solstice. At that time the days is at its shortest, the night at it lengthiest, so the celebration is the return of the light(god): Mithras. Since Mithraism was a serious opponent of the young church of Christianity, Christianity executed its usual tactique, the feast of the “Sol Invictus” (invincible sun) became Christmas, the birth of Christ. In contradiction with holy pagan places and temples, Mithraeums were not Christianised or overbuild, but smashed to pieces. This caused most remains to be heavily damaged. The Christians did their job so ‘good’, that nowadays we don’t know too much about Mithraism. Nowadays we have three small, but standard books for the general information: The Mysteries Of Mithra by Franz Cumont (1904), Mithras, the secret god by Maarten J. Vermaseren (1960) and The Origins Of The Mithraic Mysteries by David Ulansey (1989). More scholarly works are available by Cumont and Vermaseren.